For those just joining our story, the Pink Wall is pocket of multi-family condominiums bordering the mansions and McMansions of Preston Hollow located at the northeast corner of Northwest Highway and Preston Road. Within the area is Planned Development District 15 (PD-15) that includes the buildings above and fronts Northwest Highway between the Preston Tower and Athena high-rises. Because PDs operate differently than straight city zoning, a task force has been formed by Dallas City Council member Jennifer Gates and includes Plan Commissioner Margot Murphy with representatives from each of the PD-15 buildings as well as buildings in the neighborhood outside the PD. The group is addressing the development issues facing the area since March’s Preston Place fire and a developer’s interest in the Diplomat property. PD-15 began in 1947 and, as you can imagine, needs some updating to reflect the realities of this century. You can get up to speed here, here, here, here, here. Last night marked the second meeting of the Pink Wall PD-15 task force gathered together to address increased density in the area. As a reminder, the Pink Wall is essentially the northeast corner of Preston and Northwest Hwy. PD-15 is roughly the space between the Preston Tower and Athena residential high-rises. If you missed last week’s roundup, click here. 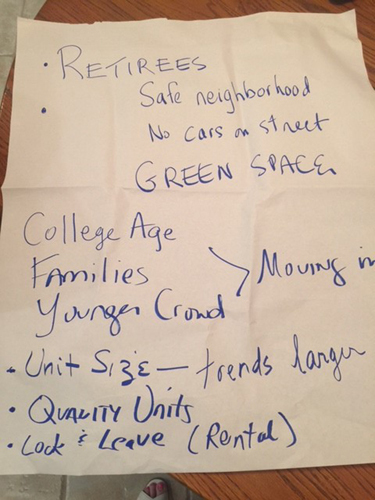 This second meeting began to tackle the issue of density and what the neighborhood’s desires are for the area. Of course before we got there, we heard more on the shifting sands of how this could play out procedurally within city government. I’m not going to go into detail here (again) because questions remain and I want to be crystal clear versus continually negating what was said previously. It’s annoying that city officials just don’t know this. Do we need to lock them in a room until their story is straight?